The geometer moths are moths belonging to the family Geometridae of the insect order Lepidoptera, the moths and butterflies. Their scientific name derives from the Ancient Greek geo γη or γαια 'the earth' and metron μέτρων 'measure' in reference to the way their larvae, or inchworms, appear to "measure the earth" as they move along in a looping fashion. 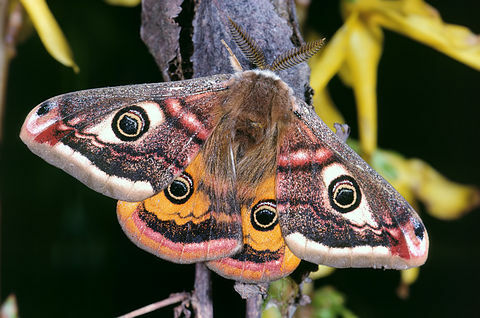 A very large family, it has around 23,000 species of moths described, and over 1400 species from six subfamilies indigenous to North America alone. A well-known member is the peppered moth, Biston betularia, which has been subject of numerous studies in population genetics. Several other geometer moths are notorious pests. Archiearinae – 12[verification needed] species; holarctic, southern Andes and Tasmania, though the latter some seem to belong to the Ennominae, larvae have all the prolegs except most are reduced. Moth from Florissant, Colorado". American Museum Novitates. 34: 1–2.